Senior Fund Manager Ben Conway took part in Exeter School’s Sixth Form Careers Week on 5th March, to talk about careers in Financial Services. 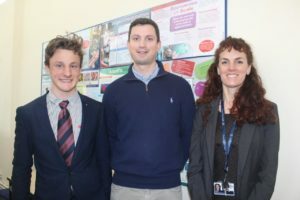 Ben spent time with the school’s 6th Form Economics and Business pupils as part of National Careers Week, and talked about his own career path, as well as giving useful advice to pupils about preparing themselves for getting the best job they can. He was keen to emphasise that although studying Economics has its advantages for a career in finance, it is not as vital as people might think. During the questions at the end of his talk, Ben was asked about work/life balance, and explained how different financial careers (eg asset management, investment banking, broking) can offer different work/life balances. Thanks to Ruth Cheesman, Careers Adviser at Exeter School, for the opportunity for a Hawksmoor member of staff to talk to pupils about the variety and benefits of a career in financial services.